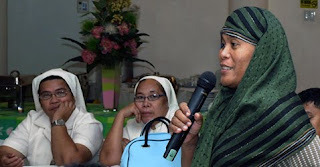 A Muslim woman speaks as nuns listen during a peace forum by the Notre Dame and the Bishop-Ulama Conference-Konsult Mindanaw held in Kidapawan City in Mindanao. KIDAPAWAN CITY, Philippines (Mindanao Examiner / October 15, 2009) – Notre Dame University and the Bishop-Ulama Conference-Konsult Mindanaw recently conducted a research utilization forum in Kidapawan City in Mindanao. Its objectives was to share to the stakeholders the regional results of the focus group consultations and dialogue with stakeholders and elicit recommendations for policies and action to further enhance the regional report. Representatives from various sectors, including from the nongovernmental organizations, business and the academe, religious and the media attended the forum. Konsult Mindanaw was a project commissioned by the Bishop-Ulama Conference which said that it a sincere response to people’s aspiration for broader involvement in Mindanao peace process. It is premeditated mainly as a series of consultation and dialogue within various sectors and across the region and promotes among groups a readiness to acknowledge past and present hurts, as well as a commitment to explore new ways of building peace.